I am sending this blog from Los Angeles, where it is poring rain today. Luckily,we spent the in the university of Southern California Science Centre, where we saw the space shuttle, amongst many other wonderful things. My grandchildren loved it all. This truly a magnificent centre, and free as well. Being it was raining and winter, the centre was nearly empty so they could do everything with no queues. Christina Pollard is the Principal Investigator on Curtin University’s Healthway funded Food Law, Policy and Communications to Protect Public Health. Curtin University has received 5 years of funding to assist the translation of research into practice through the FLPC project. She works part-time for the Department of Health in Western Australia as a Nutrition Policy Advisor for the Chronic Disease Prevention Directorate. She has co-written this article as an academic and not as a public servant and not representing the views of the Department. Rosemary Stanton does not work for, consult to, own shares in or receive funding from any company or organisation that would benefit from this article, and has no relevant affiliations. Many people eat badly because far too much of their energy is provided by nutritionally worthless junk foods and drinks. Part of the problem is the push by the food industry to get us to buy food that may be bad for us but good for its business. In the 1960s, we had between 600 and 800 foods to choose from, many of them only available at the right season. But that was before supermarkets became widespread. Now, the typical supermarket stocks about 30,000 items with whole aisles devoted to sweetened drinks, confectionery, savoury snack foods, biscuits, cakes and pastries, sugary breakfast cereals and substitute bars, and drinks full of added sugar. Any one of these foods may contribute only a small percentage of total kilojoules, but there are so many of them that together they contribute 35% of adults’ kilojoules (41% for children), as well as 41% of saturated fat (47% for children) and 47% of consumed sugar (54% for children). Of course, we must take responsibility for what we choose, but when sugary, salty, fatty items dominate what is offered in supermarkets, school and work canteens, sporting venues, service stations, motel dining rooms, clubs and even hospitals, they become the easy choices. The food industry also uses advertising and promotions to “normalise” the consumption of highly-processed foods and drinks, and its lobbying power to resist regulation. The Australian food, drink and manufacturing industry is worth A$111 billion with the big end of town represented by the Australian Food and Grocery Council (AFGC). 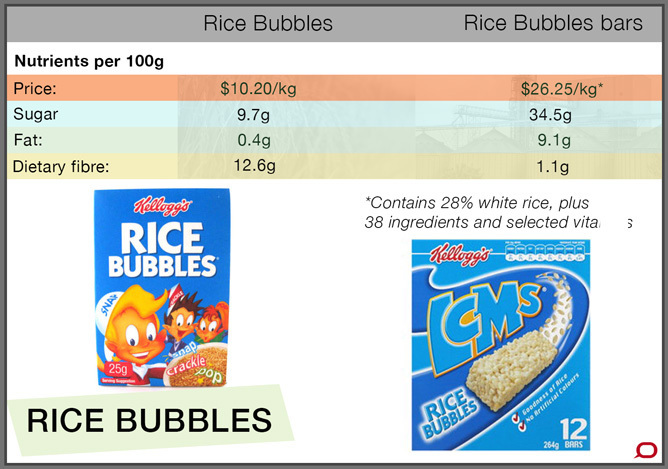 This powerful lobby group is representative of just 120 food companies out of more than 2,000, but well over 80% of the dollar value of food sold in Australia. 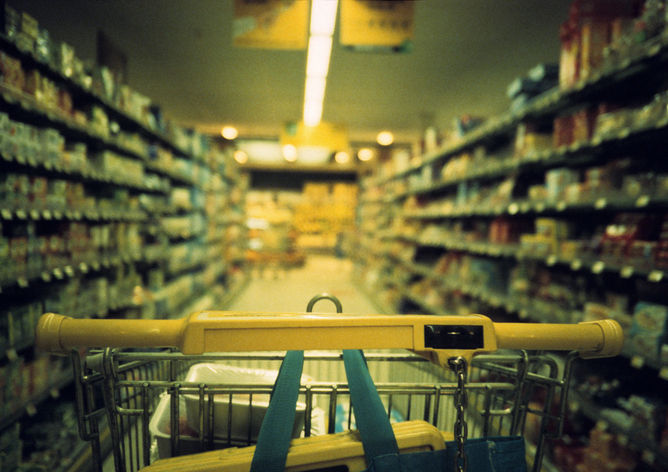 The majority of its members are large companies manufacturing highly-processed foods and drinks. No one quibbles with the fact that companies are in business to make a profit. But sadly the profitability of many food companies comes from a type of “value adding” that could more accurately be dubbed “value padding”. 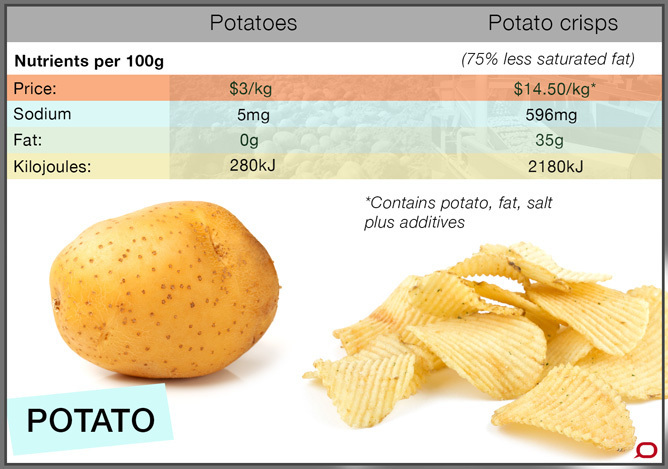 Sugar, refined starches and fat are cheap additives used to dilute more nutritious ingredients. Many fruit drinks, for instance, contain just 25% fruit juice with added sugar and water to replace the fruit juice. This kind of fruit drink is cheaper to buy than 100% juice but not as cheap as you might expect from a product that’s only one quarter juice. The juice drink is therefore much more profitable for the manufacturer. 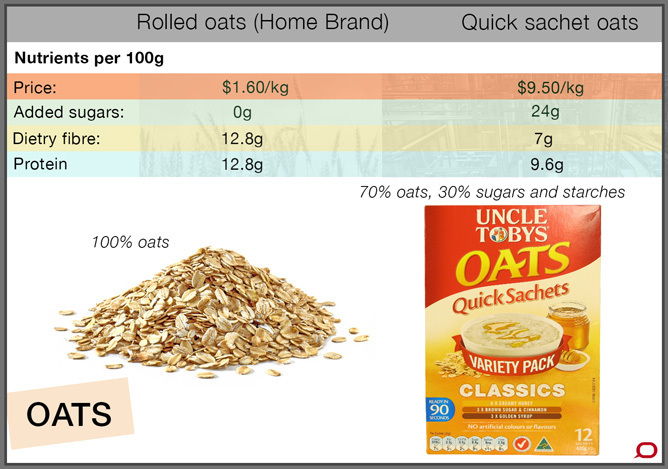 Breakfast cereals that are high in sugar should be cheaper because sugar is usually cheaper than the grain it replaces. 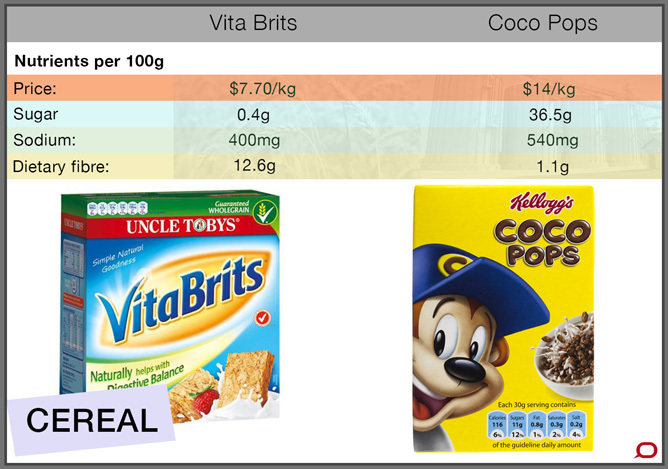 But as the sugar content of breakfast cereals goes up, so does the price. And we’re getting an increasing range of sweet products. 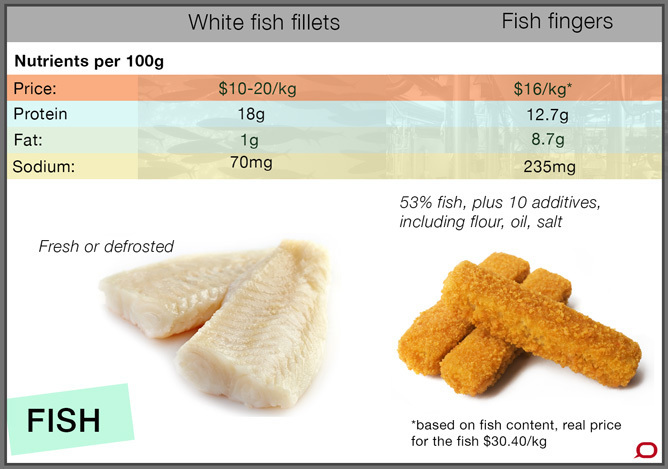 Fish is not cheap but because fish fingers may contain just 51% fish – the rest being cheap “coating” – they can generate huge profits. The coated product may appear cheaper, but remember that you’re only getting half the fish, so you’re paying through the nose for the company’s profits. Meat pies with more meat but less fat and salty gravy would be much more nutritious, but less profitable for the pie seller. Salty water is also pumped into deli meats and marinaded chicken portions and other meat products – making them less nutritious – but more profitable for the seller. The more additives in your yoghurt, the cheaper the product is to produce – and the less nutritious for the consumer. 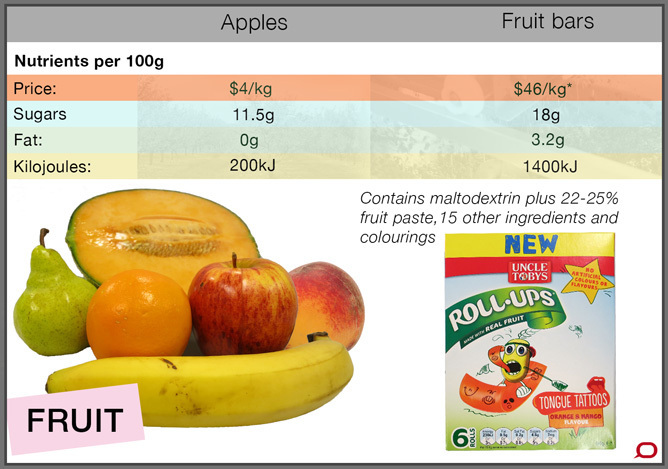 Foods with high levels of sugar, cheap fats, refined starches, salt and various additives to provide flavour and colour are profitable – and more palatable for most consumers. That’s because tastes like this encourage our survival mechanism to kick in and ensure we feast in case of future famine. For highly or ultra-processed foods, profitability depends on devoting as much as possible of the price on packaging and marketing while keeping the costs of basic ingredients as low as possible. Indeed, it’s been estimated that 50% of the budget for many of these foods goes on packaging, 40% on marketing and 10% on ingredients. characteristically formulated from ‘refined’ and ‘purified’ ingredients freed from the fibrous watery matrix of their original raw materials. They are formulated to be sensually appealing, hyper-palatable, and habit-forming, by the use of sophisticated mixtures of cosmetic and other additives, and state-of-the-art craft packaging and marketing. Further, ultra-processed products are ‘convenient’ – meaning ready-to-eat (or drink) or ready-to-heat. Unsurprisingly, nutritionists and public health experts assert there’s no such thing as a healthy ultra-processed product – and this is the crux of the problem: such products may be good for big food business but they’re terrible for health. Ultra-processed foods are widely available in convenience stores, vending machines, service stations and sporting venues. They’re designed for consumption while we are out at work or play or driving or being entertained – and we’re encouraged to see them as an integral part of life. Some are even fortified with micronutrients to give them a false halo of goodness. Sugar, added starches, saturated fat and salt are cheap so the more you can add, the more budget left for the task of persuading customers, including children, to choose your product. This has not changed over the last decade. Marketing costs are tax deductible in Australia, so, in effect, we subsidise the marketing of junk foods and drinks – and it works. Basic foods, such as fruits and vegetables, which have no packaging or value padding, have only a small or no budget for promotion. And their consumption is correspondingly low (and falling). Meanwhile foods padded with worthless ingredients are dominating the diet, increasing the costs of meals and making us sick.